Blind Guardian are frequently lauded as one of the greatest and most influential power metal acts and it’s tough to make a strong argument against that assertion. The band’s amazingly aggressive songwriting along with Hansi Kursch’s extremely versatile vocal abilities is a winning combination that continues to produce great songs to this day. Many fans and critics point to “Tales From the Twilight World” and “Imaginations From the Other Side” as their masterworks, but the record that came in between, “Somewhere Far Beyond” is often unjustly passed over. On June 30, 1992, “Somewhere Far Beyond” was released; twenty years later, this album is still powerful and catchy, and its songs truly have stood the test of time. “Somewhere Far Beyond” has far more to offer than pure speed and aggression though; for the first time, Blind Guardian decided to show off their influence from one of rock’s most theatrical groups, Queen. The short piece, “Black Chamber,” is the first sign of this, featuring a solo Hansi singing over a piano. “Theatre of Pain” on the other hand, shows Blind Guardian acknowledging the heavier, more bombastic side of Queen with a truly over the top synthesizer hook and a massive amount of vocal overdubs throughout the song. 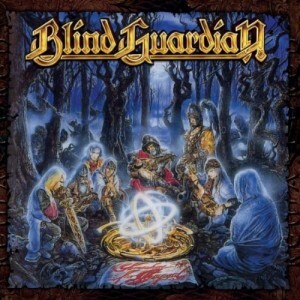 The fact that the band even included a cover of Queen’s “Spread Your Wings” on the album is only more proof of Blind Guardian’s love for the group. 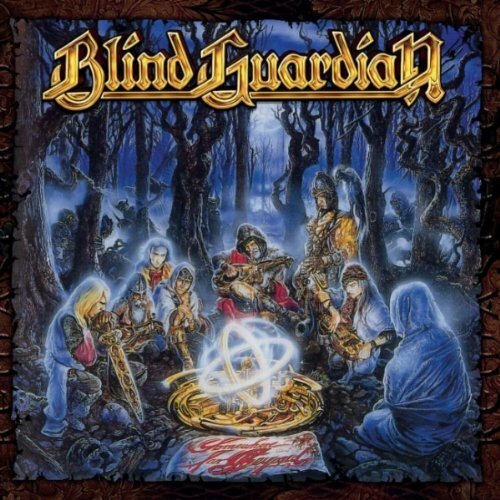 Blind Guardian also introduced their fans to their first full-fledged folk song, “The Bard’s Song – In the Forest.” This song, one of Blind Guardian’s finest, features absolutely beautiful playing from Andre and Marcus, and is a guaranteed inclusion in any of the band’s live sets. Its heavier electric counterpart, “The Bard’s Song – The Hobbit,” comes nowhere near the preceding song’s majesty and grace, but it’s a fine track regardless. The band also made another stab at writing an epic with the title track. Even though it’s over seven minutes long, it’s actually a fairly straightforward speed metal track with a massive chorus (barring that random bagpipe interlude of course). In retrospect, “Somewhere Far Beyond,” reveals itself to be a remarkably consistent album. There may not be a single track on it that matches the sheer power and glory of “Lost in the Twilight Hall,” but there isn’t a track nearly as awkward as “Tommyknockers” either. It’s an easy album to listen to in one sitting- a trait that couldn’t apply to Blind Guardian albums released after “Imaginations From the Other Side.” Sadly, many of this album’s songs have been unjustly forgotten; if I had my way, “Time What is Time,” “Theatre of Pain,” and “Journey Through the Dark” would be staples of Blind Guardian’s live set. Despite it’s consistency and high quality songs, “Somewhere Far Beyond” isn’t quite in a class with Blind Guardian’s other nineties masterworks. “Tales From the Twilight World” had their all-time greatest songs, while “Imaginations From the Other Side” and “Nightfall in Middle Earth” stand tall as truly epic and ambitious works. However, this twenty year old record is still a great album that really never has received the recognition it deserves- if you want to check out some damn fine early power metal, “Somewhere Far Beyond” should easily fit your needs.